Situated in the city centre, close to the historic Palace Pier and the famous Royal Pavilion, our English language school in Brighton is perfectly located for students wishing to study English in Britain’s most popular coastal city! Brighton came to prominence in the late 18th Century, when the Prince Regent (later King George IV) chose to build one of the world’s most famous holiday homes there, the Royal Pavilion. Nestled between the South Downs and the sea, Brighton is known as a cosmopolitan city, with a vibrant arts and music scene, as well as a fantastic variety of restaurants, pubs, bars and nightclubs. For those who love to shop Brighton offers a maze of smaller shops and boutiques in ‘The Lanes’, the oldest area of the city, originally dating back to the 16th Century. The exceptional facilities for students offered by our English language school in Brighton include free wireless Internet access and Internet lounge, 16 classrooms, 2 student lounges and patio gardens. All this means that you will be studying English in a fantastic learning environment! Our (Royal Pavilion) school offers a ‘Standard’ course of 20 general English lessons per week. Students can also choose to add either 6 or 12 additional lessons per week, focusing on exam preparation, English culture, linguistics or vocational English. Our English language school in Brighton also offers private courses and exam preparation courses for students who are preparing to take their IELTS or FCE exams. 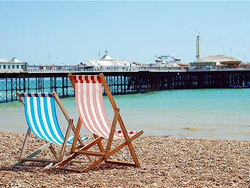 For further information about any English course at our Brighton (Royal Pavilion) school, please contact us. If you would like to make the most progress possible whilst you are studying at our school in Brighton, then you may like to consider host family accommodation. Your host family will welcome you into their home, and provide you with your own room. You will be encouraged to speak English with them, and to practice what you have learnt in class! Your hosts will provide you with your breakfast and your evening meal, or if you would prefer to prepare your own meals they will allow you access to their kitchen. If you would prefer to live more independently, our school in Brighton also offers private apartments and houses or hotel accommodation. The activities offered by our school in Brighton have been specifically designed to provide you with the opportunity to socialise with other students, learn more about the local culture, and practice your English outside of the classroom! Examples of typical activities include film evenings, football, hiking, sea kayaking, yoga, beach volleyball, pottery, basketball and DJ workshops. The school also organises regular trips to local nightclubs and West End musicals, as well as tours of London. Average score for our school in Brighton (Royal Pavilion) based on 6 previous client reviews. The course was good, my accomodation was excellent, clean and near the school. The host family was excellent as well. They were all friendly and we could talk a lot. I have learned a lot about the life in UK with them.